[Babbles] Top or bottom …24 is the next limbo. I’m sitting in a motel room, with 60s style marble floor, and hideously baroque-ish champagne-color drapes. There are 3 mosquitoes, which I have in the last 5 minutes, spotted circulating my area, ready to take charge at any sign of loss-caution. Outside, rain has finally stopped, but I’m not sure whether the sealed-in windows here are a blessing or a curse…the silence is deafening, the only sound heard every once in a while is of a mosquito or some kind of wasp who has lost his sight for one second, and therefore crashed, in what to me, is but a flickering sound, into the dreary blue lights of this dead-empty room. I’m contemplating what my 24th birthday means to me, and I really can’t think of anything. I always thought working in a slightly noisy environment was quite more effective for me. Anyhoo, my 24th birthday might suddenly have meaning because THE world’s ROYAL COUPLE has chosen it to tie the knot…for all I know, if I were in England, I wouldn’t be bloody sitting 4 hours away from home trying to work out how to make badly-organized tourism stunts look good on television on my birthday. 24 is but a number, 24 is the point of reaching the top and is the moment of slamming into the bottom, 24 is me and I am 24…is today any less or more reflective of the fact that I’m any more mature and less prone to stupidities in my life? No…because it’s but a number, a motivation for people to believe that after a day that’s called your birthday, things might and could change for the better, that with age, comes perhaps more wisdom, more opportunities, more chances to not live the way you’ve wrongfully lived so many years before. The number means a lot this year though, because of those who treasure it, those who embrace it as a new starting point for me and for that I must say, it has become more than just a number, and I thank you for making reality a little bit less harsh. With love. I’m writing this post, with my head seemingly tilted in an intellectually pleasing pose, as if I’m really contemplating yet another year more well-delved into my 20-something life. The truth is though, I just have a bad twisted neck from sleeping like a monk who slammed forward and snoozed off during his chanting session. 1. Obey the clock! Accept the fact that I’m no longer an irresponsible, procrastination-prone college big baby. Sleep when I should, greet deadlines as they’ve been set and maybe then I won’t get a twisted neck. As my prof. from Reuters (met the guy today) says, DONT be on time, BE EARLY! 3. Eat Breakfast and Exercise! ? I won’t comment on this until I’ve made some solid progress if not start…. 4. Progress workwise! I’d like to learn how to use Adobe After Effects and start a collection of reports, put my environmental studies major somehow to use. Any snazzy name for a short weekly sequence on the urban ecology? 6. Apologize to Photography! something I’ve kind of left hanging for the past 6 months and I can imagine if my D60 could talk, how much of a grudge it’d hold against me. Either need to continue doing what I’ve been doing or learn this the right way from the right person, Question: Who? 9. Parlez Francais?! I won’t anymore if I just stick to reading Reuters’ updates every night. 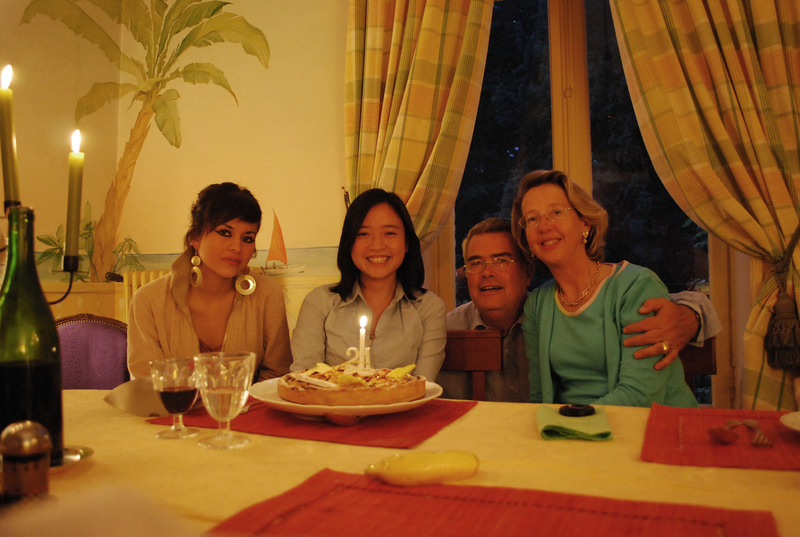 My host parents in Nantes, yes you remember them from my early blogs, we still keep in touch so that helps with the written language a bit. I’ve gotten some old novels too. For the conversation part, I’ve found this biweekly hour-long speaking club that’s free. I’d love to take classes at Alliance, but with its fee and schedule, completely not working to my advantage, the club will just have to do. 10. Make a 2010 30-second Year-in-Review! Now this is going to sound super-narcissistic, but I saw this video on CNN I-report, it was a submission to a 30-second year review competition. The man took a picture of himself every single day for the 365 days of the year that there are, at the same spot each time, put it together, reduced the speed to 30 seconds. It was like pantomime being fast-forwarded, absolutely amazing his facial expressions, change of hair, beard, whatnot. It’d be wicked if I can do something like that, but I’m planning to have other people in it too./. I almost added, ‘be cyber-ly updated’, but decided not to. Besides the fact that “cyber-ly” is not a word, you’d know by now, after the 2 years I’ve had this blog, that it ain’t going to happen…If it does then hurray, but otherwise, won’t spoil your plate of expectations.This is it so far, there are some others, but this isn’t gonna exactly be the Bridget -Jones’ -resolution -list -with -“Get the guy”, “Smoke 1 less cig”,- “slice 1lb off your bum”- kinda post. So yes, kept it nice, simple and transparent, easier to follow and also easier to accept the possible failure of a set of 10 things then obviously chasing my own tail with a gazillion ambitious peaks that will only seem blurrier as the year throws its fist at me. Happy New Year loves! [France] Et alors, la vie continue!